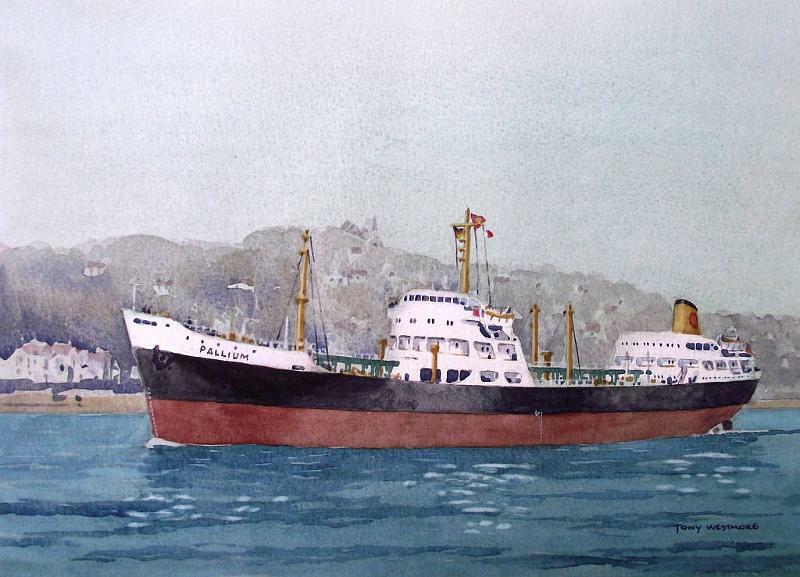 Completed 1959 as Pallium for STUK as bitumen-carrier. 19-4-1982 arrived Gadani Beach for scrapping. 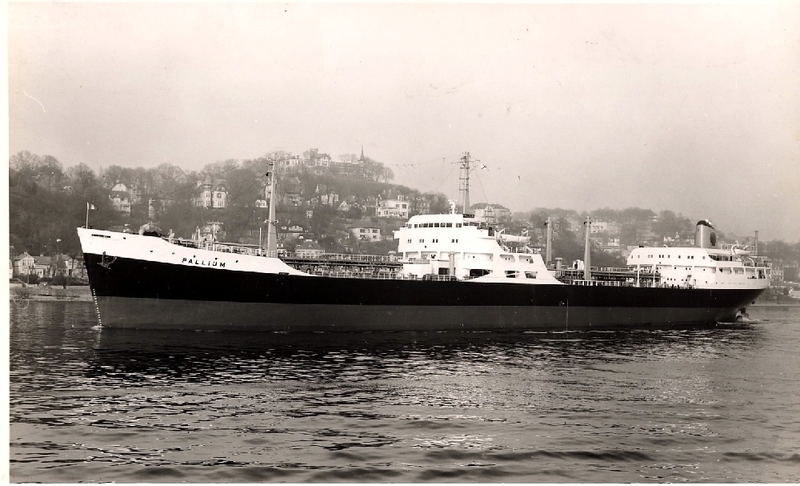 Michael Mitchell 5th engineer, 4th engineer 1959 to 1960 fifth engineer building yard & maiden voyage. James W. Crosby fireman/watertender 1961 f.w.t. Blacked out while along side in Fall River. The diesel generator then threw a wobbler and I believe something akin to panic ensued while we tried to find an engineering workshop open at the weekend. If my memory serves me right the 3/E was injured during all this.Wonder if anyone else remembers this. Does anybody know what happened to Sam Pullen? The youngest 2nd mate in STUK at the time - Onboard Pallium from sept 1974 to Feb 1975. Beleieve he went on to the Opalia in 1975.
i am sure the bosun's name was macsweeny ? joined the pallium in gibralta in 1970 i think . flew from heathrow with crew including colin the second steward. wonderful time in gibralta waiting for ship to arrive. fond memories of trip , wish i was young again . Was an Engineer Cadet on Pallium in 1981. While walking along the aerial gangway from aft accommodation to midships accommodation I passed through a metal archway to shield you from the elements a midway point. As I was passing through a bellows joint on the deck steam line gave way and peppered the archway with pieces of carbon sealing rings. Ding, ding , ding.... lucky it wasn't my head. I still have a piece of the carbon ring I kept as a souvenir. Joined July 73 in Dublin.Left October 73 in Larvik.Sailing with Captain Henry J Third for the 4th time.Met relatives I did not know I had in Dublin. although the name and port of registry were still visible on the stern. Can't help but wonder how many times they had been together in Curacao in the sixties and seventies. A Sabbeth days journey part2. I phoned the Agents who said they will try to sort it out but to no avail. Eventually they told us to book into the Hilton hotel next door to the airport while they tried to sort something out. By this time we were so fed up we cheered ourselves up with a slap up meal, blow the expense Shell were paying. Next day we check in again the airline had to put up a $10,000 bond on each of us in case we absconded. We were escorted onto the plane and sat in First Class. Upon arriving in New York we were suppose to change airlines but the other other airline wouldn't accept us. We had to wait until 7pm when the original airline had a flight going to Jacksonville. By this time the airline had lost interest in us. We arrived in Jacksonville at 9pm to be told by the Agent that the ship was not coming here but going to Port Everglades which is at the other end of Florida. I said would we be flying tomorrow. No he says you are travelling by Grey Hound bus. Next day we travel the length of Florida boarding the ship that evening seven days after leaving home. The Pallium was my first command. After being on the UK coast for a couple of months we loaded for West Africa and the Azores. We arrived at Punta Delgada in Sao Miguel island on New Years day 1980. The day before there had been a severe earthquake On another Azores Island where their main communications to Europe had been destroyed. Several Officers and crew joined. After discharging I had no outward orders so as the phones to Europe were out of action I asked the port authorities if I could use the ship's radio which they agreed. I phoned Shell International and was told as there were nor orders to stay where we were. I also phoned my wife. A couple of days later Bert Barker in the personel office phoned my wife to find out if she had heared anything from me as the relatives of those joining were concerned because as usual the News on the TV had shown the earthquake affecting the whole of the Azores. So he was able to tell them that he had spoken to the Captains wife and that all was well. We were there for a week and we went on a couple of tours of the Island. What a beautiful place, there are 2 lakes in the bottom of a volcano, the water in one is cloured blue and the other green. We also went round a tea plantation and to where the thermal springs are. Next we went to Lome (Togo, West Africa)where my wife (Shirley) joined and we Loaded for New York. When we got into the vicinity of the Bermuda Triangle we encounted 60ft seas. 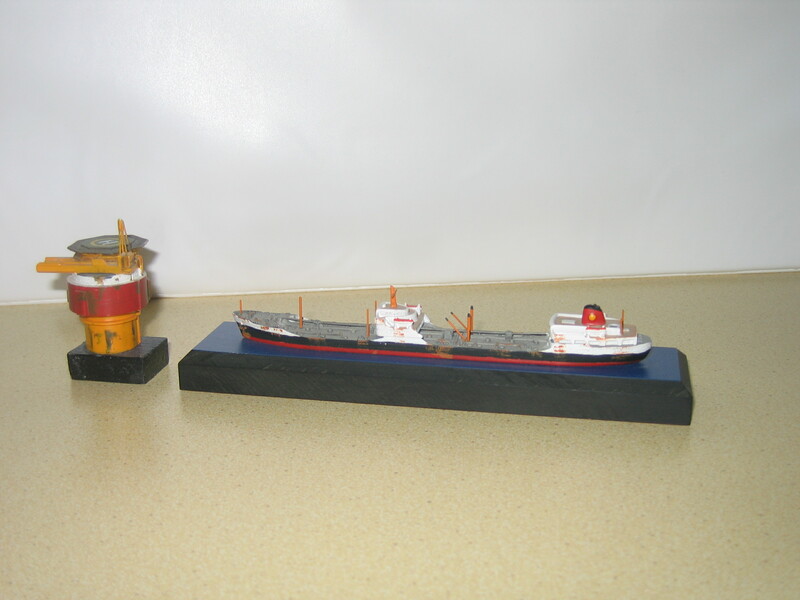 I put the ship on 70 rpm which would normanly give a speed of 12 knts. We made 48 miles in 24 hrs. It took 3 days to ride out the storm. Thankfully we didn't suffer any damage. But there were ships arriving in New York and couldn't anchor because there gear had been damaged. 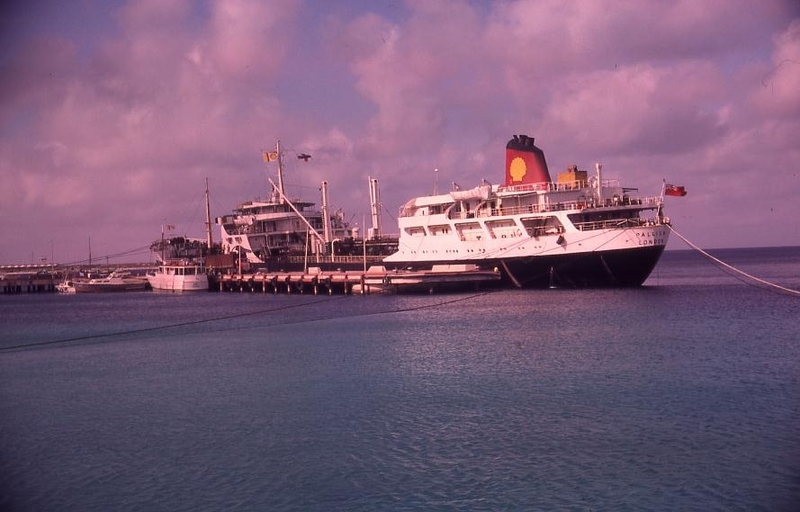 February 1965 we had some VIP passengers doing a round the world trip on Shell. On the return voyage from Aukland NZ to Curacao we stopped off Pitcairn Island, home to the mutineers of the Bounty, to pick up their mail. I met and have the privilage of shaking the hand of Fletcher Christians Great, Great, Great Grandson. He was the island's Radio Officer. My first Joe Boat as an Appo after South Shields. Joined in New York and will never forget that the main cargo steam heating lines ran under my cabin. 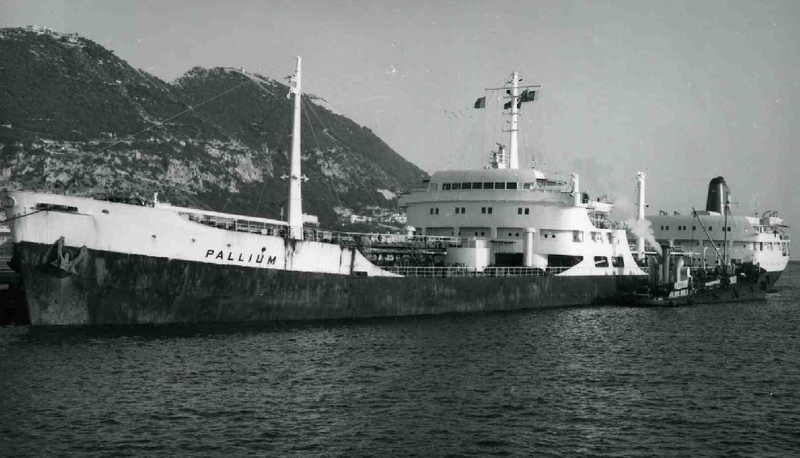 Have you sailed on Pallium? Log in and add yourself as a sailor to the Pallium! Log in and add your personal story to the Pallium!